Stunning Antique Kashan design rug with intricate craftsmanship. Ideal for a living room or bedroom. Primary colors are antique brown and ivory colors. It is ideal for a living room and a bed room as well. 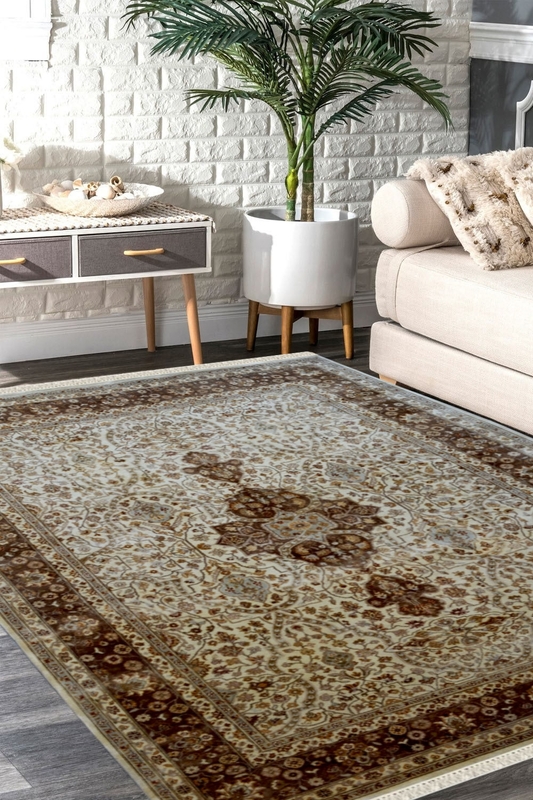 Beautiful Medallion Kashan design Kashmiri handmade rug with an antique look. This rug has a very intricate pattern and it has taken 9 months to weave it. The center has an antique brown medallion with ivory ground and dark brown detailed border. This Persian design beauty is an open field of geometrically stylized floral motifs. The design has been originated from the Norther Western part of Central Asia. Primary colors are brown and ivory. It can easily be vacuumed in the direction of the pile and is very durable. Ideal for a living room with rustic furniture and minimum decor.